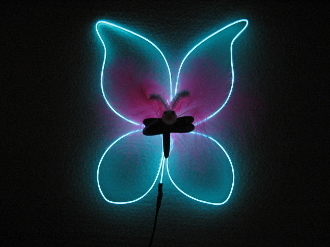 These amazing Butterflies glow. Each one is unique, handcrafted by artists in the USA. The petals are bendable, so you can modify the flower anytime. They have a small battery pack attached to the Butterfly that holds one AAA battery inside. The battery is not included. The Butterfly and battery pack each have a locking pin on the back to attach them to your clothes or hair. Light weight, only about one ounce. The Butterfly measures 5 inches wide by 6 inches tall. You can bend the wings to other shapes. The centers are made from a variety of materials including silk flowers. The last photo shows the colors of EL wire that are available. It is plastic coated wire that glows when you turn it on. It is bendable and will hold its shape. It is about 2.2 mm in diameter, about the same thickness as spaghetti. The battery box is black, and small; about 2 inches long, by 1 inch wide, by a half an inch thick. There is a connector so that you can unplug the flower from the battery box. This allows you to feed the wire through a hole in your hat or clothes, so that the flower can be outside while the battery is hidden inside. There is a switch on the side of the battery box to turn it off, or to steady on, or to blink mode. Colors available are: Red, Orange, Yellow, Lime Green, Green, Blue/Green, Blue, Purple, White, and Pink. See the photo of the spirals of wire.